Imagine that nursing is something new. Forget the connotations of the Carry On films, the sultry and simple nurse, the angel, the battleaxe and the handmaiden. What is left is something that at its simplest promises brilliant insight into the human condition, and at its most skilled includes diagnostics, academia and surgery – all intertwined by the purpose of enhancing and saving life. Nursing has changed. Yet the word nurse is steeped in such stereotype that it belies our skilled work. The perception of nursing might seem separate from its reality, but the former feeds into the latter, affecting nurses’ professional identity and development, personal and social worth and, crucially, recruitment to the profession. Gender underpins all the nursing stereotypes: the word nurse itself has become inherently female, hence the term ‘male nurse’. This attachment to gender has always been to the detriment of our profession. It reinforces the idea that it is a woman’s duty to nurse, as opposed to her right. It is also no doubt responsible for the statistic that only two fifths of parents would be proud if their son became a nurse, according to a survey commissioned by NHS England. NHS England’s nursing recruitment campaign nicely removes gender and stereotype from nursing’s image. It portrays the diversity of our workforce while paying equal homage to our expertise and compassion. The future of nursing depends on men. Not for their heroism in swooping in to save the day, but for their potential to fill the thousands of gaps in the workforce and simultaneously pull nursing into a gender-neutral realm. Rather unhelpfully, feminism has historically had a strained alliance with nursing. During its second wave in the 1960s, some feminists alienated nurses, urging bright women with an interest in health to eschew nursing for medicine. Indeed, this tension – and tendency – still linger. However, the relationship between nursing and feminism need not be so difficult. Both are fundamentally bound by reverence for life, individuality, freedom, equality, empowerment and independence. Yet these values become lost in the deep-seated patriarchal structures of the healthcare system – the ones that saw nurses as poor, uneducated, subservient women, and doctors as wealthy, omnipotent and omniscient men. The respective wages and status of the roles reflected this disparity, and often still do. It is difficult to prove that the issues surrounding nurses’ wages are rooted in gender, but it is equally difficult to accept that they are not. Until we can compare nursing and its 90% female workforce to an equally male-dominated profession with similar responsibilities, it is impossible to judge the extent to which gender dictates pay. Under Agenda for Change men and women in the same role earn the same wage. 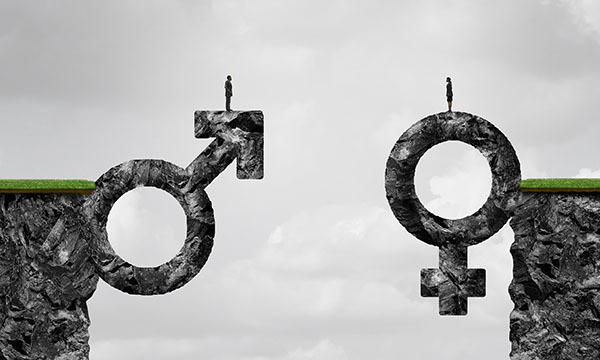 A recently piloted initiative – which is not ready to be publicly identified – aims to go further in challenging the gender pay gap. Those involved in the pilot want fairer gender distribution among the winners of Clinical Excellence Awards. These are hefty bonuses exclusive to medical consultants, dominated by men, and are responsible for the statistic that sees the mean bonus pay among men in one Yorkshire NHS trust at £9,299, while among women it is £2,428. Female employees predominantly receive their bonuses for longevity of service. It is difficult not to interpret this as men being rewarded for their brilliance and women for their fidelity. The initiative focuses on closing the gap between female medics and male medics at the top, which is commendable, but does nothing to recognise and incentivise clinical excellence in nursing. Nursing is not hindered by just a glass ceiling – the ceiling is concrete. The NHS has made important steps in addressing its gender pay gap, but it needs to readjust its approach. This should not be about comparing female apples with male apples, but reshuffling the entire fruit bowl. The RCN would do well to work with NHS equality and representation teams in leading the challenge to the ingrained devaluation of nurses’ work. What now? We must capitalise on nursing’s feminist and professional potential. First, we cannot be what we cannot see. Let’s parade and celebrate our nurses, subverting the reigning stereotypes and reclaiming nursing as a career for the brilliant, the passionate and the pioneering. As feminism enjoys a resurgence, let us ask it to recognise that nurses’ struggles are symbolic of female struggles and embolden our nurses. It is just as radical to enter a profession with a view to emancipating it from gender stereotyping as it is to enter a field historically dominated by powerful men. RELATED: Has the ‘women’s work’ stereotype been holding down your pay? Second, let’s confront the stigma around money. It is true that we don’t go into nursing to become rich, but this cannot be allowed to be a trump card used against us when we are negotiating for more. And let’s expect improved working conditions, space to flourish and recognition of excellence. Ultimately, the NHS wants to benefit from the talents of all. There are some very talented nurses out there. Let the sky be the limit and see how they soar.